N0HYD - QRP & Portable Adventures! : Just get on the air! So after my complaining in my post yesterday, I had a chance last night at about 11:00 pm local (0400 Z) to get to the shack and spin the dial on 40 meters. I heard several QSO's going on - including N1CC calling CQ. He was a bit faster than I like, but I could at least copy his call and CQ CENT. I heard a couple guys work him and when he called CQ again, I threw out my call. He came right back to me for a quick contest style exchange. Jim is down in Texas and is VERY ACTIVE! 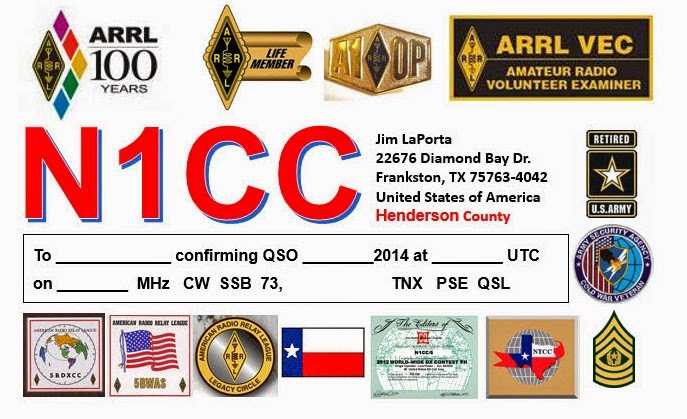 H says on his QRZ page he has had over 16,000 QSO's in 2014. He is also offering a special QSL card for the centennial year. I might have to take him up on that. He also does a Christmas Carol special event station at Christmas. Very interesting guy, and a fun contact. I also heard a few 4 zone stations in QSO's as I tuned around 40 meters.